Today, I want to make a small confession. There is a certain Mecca store that has a pretty much empty tester bottle. And I am reasonably certain it was me who emptied it; over the course of a few months. So, I got a bottle for free, in a sense. I did end up spending the paltry $80 for a bottle of my own. I felt absolutely shamed that I had really received two bottles for the price of one. As this was the very last bottle on the shelf, the tester with zilch but bubbles of air in the spritzer hose was then put away in the drawer. I almost asked if I could have it. But I kept my shame to myself. Antonia’s Flowers is the perfume that I am talking about. It is such an unassuming bottle and a very plain box, and for some reason, Mecca stores often keep this on the lowest shelf and in the corner. Mine had been sitting there for a very long time. The box lid is faded and there was a thick layer of dust on the top when I bought it. The first spray of the tester was over a year ago and I hastily put the tester down with a look of disgust on my face. The opening is harsh and hard hitting. It still is something I am not used to, but I now know to avoid my wrist for a few minutes. I have to admit that this is straight up freesia. There are other notes listed, but I don’t get any of them until the last 20 minutes, and that is after freesia assault for an hour. By this stage, it is a very close skin scent anyway. It is evident that Antonia was a florist; the scent is uncannily haunting and indicative of a haute florist at the height of spring. I can imagine WASPy Hampton brides in the late 80s and early 90s using this as their signature wedding scent. While this is most certainly a white flower fragrance, it is not polite or gentle. It is unapologetically bold and haughty. There are a few things that annoy me about Antonia’s Flowers. First, it really does only last an hour and a bit on me. Second, the lid does not fit on the sprayer. I had to unscrew the lid, to then screw on the sprayer, and the lid does not fit on the sprayer. Third, the long necked sprayer stops the bottle from having the lid of the box close. I like to keep my perfumes in their boxes, so this does irk me. Then there is the BUT… I adore this scent. I truly do. It takes me back to the days I’d ramble down the alley ways of the rural town I lived in as a child. All sorts of wild flowers grew along people’s back fences and along the creek beds. Older women would spend hours in their cottage gardens and I’d take in all the smells on my walks. 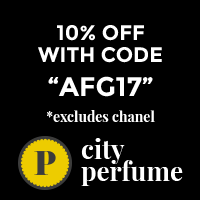 What shameful perfume secrets do you have? You know you want to share…I dare you! Hey Kate! Shameful perfume secrets…. hum… I think mine would be that I don’t throw out empty perfume bottles. If I ever finish one (a rarety these days) it’s because I enjoyed it so much and the empty bottle is a treasure trove of memories. But really, I’m stuck for storage space as it is & shouldn’t hold on. 🙂 Lovely review! I hope you feeling well. You look sensational, according to Portia’s last picture of you. Do you display your bottles, or keep them as collector items? What about the boxes? Do you finish completely the scent from the bottle, or do you keep a tiny bit for posterity’s sake? I bought a bottle of Antonia’s Flowers from Mecca a couple of years ago. At the time it was around $150, so it was a big purchase and a blind buy, but it promised freesia – my favourite scent in the world. When it arrived, I too was disappointed with the box and the bottle, but the biggest disappointment for me was the freesia. It was a soft floral once it softened, but the freesia was hiding in there somewhere. I just didn’t get it – there were too many other flowers in the bouquet. So, I reboxed it, and put it at the very back of my perfume cupboard – heartbroken that I had spent so much on something I wasn’t going to wear. It stayed there until I finally sold it (for much less) to someone who loved it and loved the freesia. So, it was me – it was my skin that soaked up the freesia and kept it hidden. But I’m so glad you enjoy it and the freesia dances on your skin and doesn’t hide. What a wonderful review Kate – and a happy ending. Wear it with joy! Darling Monica, how devastating!! Either way, disappointment was a certainty. Even if you could get freesia 100% like I do, it is so fleeting. I’m a bit sad I don’t get the other notes. Still, it remains my spring zest pick-me-up. Stunning for the moment I have with it. Definitely NOT a blind buy safe scent. Do you have any other freesia scents? How do they perform? I have Sweet Kate! Christian Dior Forever and Ever – the original in the opaque pink bottle, not the “reimagined” new release. It is so beautiful and hard to find that when I do find one, I buy it. I have 4. It smells of the golden coloured freesia which has the richest scent – I grow them in pots in my garden. The freesia stays from first blast to drydown and makes me happy. Longevity isn’t great, but I’ve got 4 bottles so….. I remember trying Antonia’s flowers and thinking how beautiful it would be for a springtime day out. Maybe even remembering spring i the depths of winter or glare of summer. It is a stunning one to use as a pick me up or to remind one’s self that spring does indeed exist. Gorgeous on a hot morning too. Haha, do the Mecca staff whisper about you when you floated out of their store?! Nah, Jackie! If you can get the real deal, forget the perfumes! As much as I adore Antonia’s Flowers, and I appreciate the craftsmanship of what was achieved, real freesias are divine. Enjoy and breathe in deep! I really don’t care any more about sales assistant impressions of me any more. If tbey won’t give me samples to take home to try, they are just gonna have to wait for me to try and try til I’ve made up my mind. Bahahahaha! I liked Antonia’s Flowers from the sample I got from the brand’s site, bought a used bottle of it on eBay many years ago, wore it until perfume went off and never re-purchased it. My absolute favorite from the line is Tiempe Passate. They haven’s done a new perfume in a while now but I check their website from time to time – and they seem to be still alive. It makes me feel good every time. I hope you’ll keep enjoying your [second 😉 ] new bottle.